HASTINGS have established a six-point gap between themselves and sixth place with a big win over Tyabb to put themselves in pole position for a finals spot. Hastings showed their intent early with a stunning five goals to zero first quarter in tough conditions, which set the tone for the remainder of the afternoon. Tyabb fought back to get within reach, but ultimately ran out of time and fell short by 16 points, going down to Hastings 10.7 (67) to 8.3 (51). Shaun Foster booted four goals in a best on ground performance for Hastings, while Jake Anderson impressed for the Yabbies with four goals of his own. It was business as usual for top of the ladder Dromana at home, as they beat Devon Meadows in a fairly comfortable victory. Devon Meadows kept in arms reach in the first term and went into the quarter time break only down by four, but Dromana quickly asserted their dominance in the second quarter. Devon Meadows were held scoreless in the second term, as Dromana ran away to a convincing lead that they would not let go of throughout the rest of the game. Rikki Johnston played his best game for the year, booting four goals for Dromana to help his side to an 8.15 (63) to 5.8 (38) win. There were also no surprises at Ballam Park Reserve as Karingal claimed a solid victory at home against Pearcedale. Coming off a shock loss to Langwarrin last week, the Bulls were looking to bounce back with a vengeance. The Bulls worked hard to put on a complete team performance, as they had eight individual goalkickers contribute towards a healthy win. With Chelsea hot on their heels, the Bulls could not afford to slip up, and they kept a hold of second place with a convincing 8.12 (60) to 6.5 (41) win. Chelsea needed to win to keep in touch with Karingal, and they did so in impressive fashion over a disappointing Rye outfit. The Seagulls struck hard early and has established a 22 point buffer by quarter time, which would prove to be insurmountable in the rough conditions. Scoring just one first-half goal, Rye struggled badly and never looked a chance against their impressive Chelsea opponents. James Brain and Curtis Bywater kicked four goals each for Chelsea, the latter taking his tally for the year to 47, as the Seagulls claimed a comprehensive win 13.9 (87) to 4.6 (30). The win helped close the percentage gap, and they are now only marginally behind Karingal going into the closing rounds of the year. At Red Hill Recreation Reserve, Langwarrin travelled to take on fourth-placed Red Hill. Langwarrin came into the contest full of confidence having knocked off Karingal last weekend but unfortunately could not back up that performance. The Kangaroos started strong as both sides kicked two goals in the first term, but Langwarrin quickly lost control of the game as Red Hill held them scoreless for the next two whole quarters. Red Hill quickly kicked away and put on one of the most impressive defensive displays for the year as they ran away to a comfortable win. 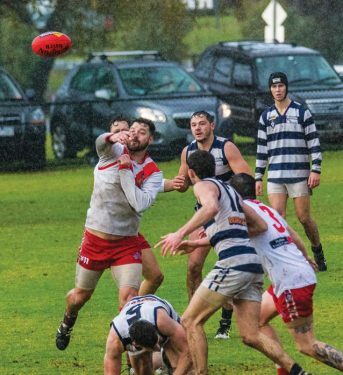 Langwarrin managed to score a few behinds in the final term but again failed to score a major as they went a stunning three quarters without a goal. Ben Hughes impressed with three goals for Red Hill, as his side completed a comfortable 7.13 (55) to 2.5 (17) win. In the final match of the weekend, Somerville hosted Crib Point in what would turn out to be another miserable afternoon for the visitors. Crib Point approached the game looking to claim just their second win for the year but were quickly put on the back foot as Somerville took a 15 point lead into the first break. Crib Point were able to prevent the home side from blowing out the lead too much, but ultimately could not fight their way back into the contest, as they went down to Somerville 9.8 (62) to 4.9 (33).